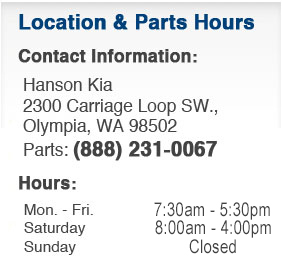 Your Kia is a great investment--make sure you keep it safe while adding great style with genuine Kia bumper accessories from Hanson Kia, proudly serving Tacoma and Puyallup! From front bumper guards to rear bumper protectors, genuine Kia bumper accessories look great--and what's more, they keep your bumpers from getting scratched and scuffed. Stop by Hanson Kia, serving Hawks Prairie and Lakewood, to protect your Kia while making it look even cooler!